Enhancing the Wellbeing and Wisdom of Older Learners: A Co-research Paradigm examines how lifelong learning, becoming wise, and sharing wisdom are integrally linked to older people’s wellbeing. The book highlights appropriate learning styles and pedagogies for older people, including research models emphasising participation, and offers recommendations for research in lifelong learning with the potential to effect change. Focusing upon a collaborative action research project, ‘Sagaciation’, chapters explore the involvement of older learners in the design and delivery of the scheme, which enabled them to expand their knowledge and skills, and to fully engage as critical and creative voices in a supportive and welcoming environment. The book offers an account of the process of the action research, as well as its findings. The project is set into the context of leading academic thinking on fields such as the growth of an ageing population, the rise of literature on ageing, negative and positive constructions of ageing, social gerontology, the wellbeing and health of older people, and educational gerontology. 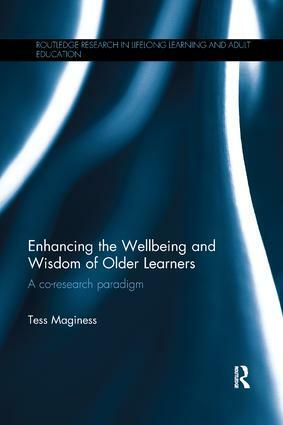 Tess Maginess is Senior Lecturer in Education in the School of Education, Queen’s University Belfast, Ireland, where much of her work is with older learners. Tess has been awarded a National Teaching Fellowship, has been shortlisted for the Aonatas ‘STAR’ awards for her research project ‘Sagaciation’ and previously won the BERA-SAGE Research Practitioner of the Year for Adult Education. She has published on literature, education and mental health.